I made this healthy dessert with my little nieces in mind. They all have different tastes and dietary needs, so it isn’t easy coming up with a dish that all three will enjoy. I’m pretty sure fresh peaches, raspberries and the playful, nutty flavor of crumbly buckwheat will please them all – at least I hope so! Down in Australia, where they live, it isn’t exactly peach season like it is here in France, so I’d say they could get away with frozen fruit until summer comes along. I used my favorite small ramekins for this recipe, which makes enough for 4 people. 1. In a saucepan, melt butter (if not using, put a small amount of water in the bottom). 2. Add fruit and cook over medium for about 5 minutes. 3. Add maple syrup and lemon. Simmer for about 2 minutes. Set aside. 4. Preheat oven to 190°C (375°F). 4. In a mixing bowl, combine flour and butter (in small cubes) with fingers until you have a crumbly mixture. 5. Add brown sugar and mix, but don’t overwork. 6. Divide the fruit evenly in the ramekins and cover with the topping. 7. Sprinkle with the almonds and bake for about 30-35 minutes, until the topping is fully cooked. 8. Serve warm with whipped cream, vanilla ice cream, fromage blanc or plain and simple – whatever suites you. This entry was posted in Recipes (All), Recipes (Gluten-free), Recipes (Vegan) and tagged dessert, fruit. Bookmark the permalink. This looks super good. Love the peach-raspberry combo, and I’m intrigued by the buckwheat flour. Might have to give it a try! 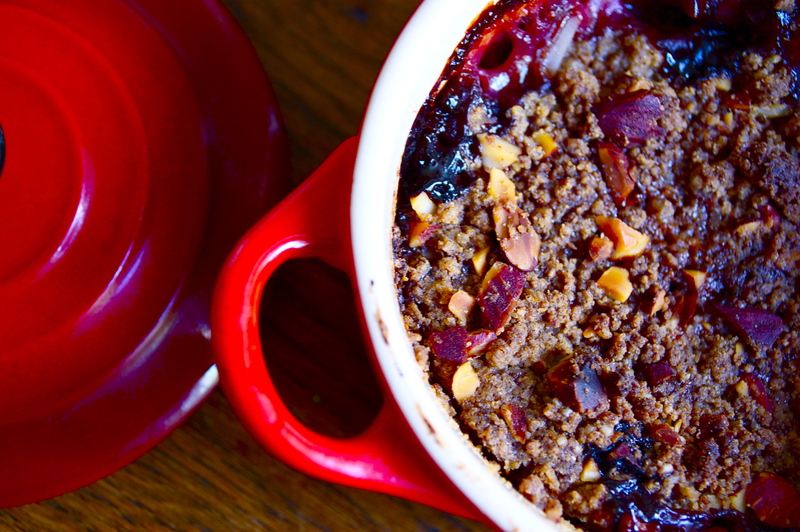 Yes, the buckwheat definitely gives this crumble a unique, nutty flavor. The more I play with different flours (buckwheat, spelt…) the harder it is to go back to plain old white – but, of course, you could use it in this recipe if you’re going for a more traditional dessert.